John Quill plays for Dolphin RFC but also has ten international caps for America. Quill (far left) has a tricky time balancing his day job with his dream of playing at the World Cup. A NORMAL DAY for John Quill sees him rise at 5.30am, when he goes to the leisure centre in Cork where he works as a personal trainer. He works there until 2.30pm, then has a nap for an hour before going back in for a gym session of his own. Then he goes to Dolphin RFC for an evening of training. The only time that schedule changes significantly, is when he is in training camp preparing for next year’s Rugby World Cup. 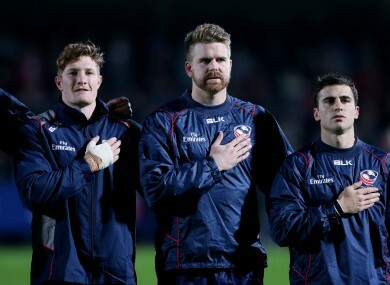 Quill commutes between Cork and America, where he has established himself in the back row of the US Eagles team. He has ten caps for the American national team since 2012, when he emigrated to Boston after leaving the Munster academy without a contract. Quill’s club rugby career has seen him involved with Youghal, UCC and Dolphin while his foray into the professional game saw him link up with London Welsh and currently, the Munster A side. “I think my situation in general is an unusual one,” Quill said. Quill is right about the strangeness of his situation – balancing his day job with preparing for a World Cup is straight out of a sports film. The flanker was in the Munster academy at the same time as other back rows Peter O’Mahony and Tommy O’Donnell so it was always going to be a tough ask to get ahead of them. He says after leaving the Munster set-up, he needed a bit of a ‘change of pace’ so opted to move Stateside with his girlfriend. He spliced his best bits into the above video for the US selectors and it was enough to catch their eye. It was a completely different experience for Quill, although he eventually settled in, on and off the pitch. “It is a very different culture to the one in Munster,” Quill said. “The camps are very short because the guys are playing all around the world but it is still very professional. Their attitude and enthusiasm is infectious, 100%. They have a lot of good players in the squad – Samu Manoa, Blaine Scully, Chris Wyles, so their is plenty of talent there. Quill has gotten eight starts for the Eagles, two more appearances off the bench and scored his first international try against Tonga this autumn. He appeared in three of the Eagles’ four autumn tests in November – unfortunately the one he missed was against the All Blacks in Chicago. He helped London Welsh get promoted last season and was distraught when he was let go before the Aviva Premiership season. Although, given Welsh lost their first nine games while conceding an average of 46 points per game, it might have been a blessing in disguise. For now, his focus is playing for Dolphin in the AIL while getting ready for that big tournament next autumn. “I go over and back for various camps and next year we will have the Pacific Nations cup to get us ready for the World Cup,” Quill said. Quill qualified for the US through his mother, who was born in Staten Island in New York. While he is a proud Corkman, he has really bought in to the USA’s famed passion. Although, he doesn’t belt out ‘The Star Spangled Banner’ with as much gusto as Peter O’Mahony does with Amhrán na bhFiann. “I don’t quite do it like him,” Quill laughed. If you’ve ever been in the bar of a prominent rugby club, you might have noticed a sort of ‘wall of fame’, where the portraits of internationals from the club are hung. Usually, these are of Irish internationals but Quill was delighted to make the wall of his current team and his boyhood club. “I have one of my jersey’s up on the wall in Dolphin and another in Youghal,” Quill said. The downside of Quill’s current position is that to make a World Cup squad, he will basically have to train as a professional on his own time and with his own money. But his good form for Dolphin and the Eagles has already started to pay off. He took the call for this interview in the hotel the day before Munster A played Moseley and he says victories like that are what keep driving him towards next autumn. “It is very tough at times but every so often you get something that will motivate you to keep going,” Quill said. ‘It’s ridiculous to compare’ – Should Leinster be measured against Schmidt’s side? Email “From the gym to the World Cup: There's an Irish personal trainer who plays flanker for USA”. Feedback on “From the gym to the World Cup: There's an Irish personal trainer who plays flanker for USA”.